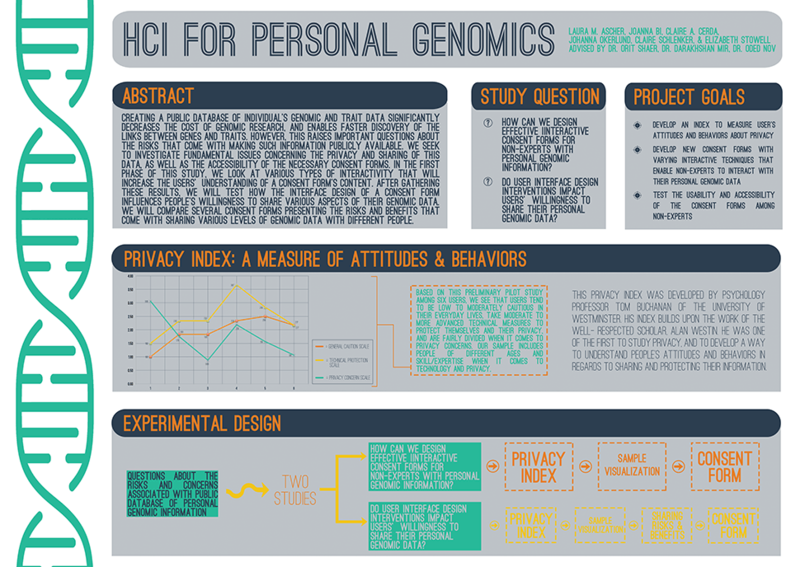 How might we re-imagine consent forms for personal genomic tests to provide more information about the risks and benefits for contributors and positively influence their willingness to participate in public open source genome databases? I led the research on this project, researched and implemented the privacy index, contributed to the experimental design of the usability testing of improved consent forms on Amazon Mechanical Turk, and designed the poster for the Wellesley College Science Center Summer Research Program conference. Claire presenting her work with my professor, Darakhshan Mir at the Wellesley College Science Center Summer Research Program conference in Wellesley, MA.